Remember last year, when every month I would update y’all on my debt repayment? and how I was planning on being credit card debt free by the end of May? I’ve been stupid. Like… actually stupid. Prior to last year I was more oblivious to money than I am now, so I have no excuse. I started thinking about the differences in where I’m at now and where I was at a year ago and I realized… well, duh! I posted about it. I had accountability. I never wanted to post that my credit card had gone up instead of down, so I worked hard. So as long as you promise not to judge me for where I’m at now, I’m going to get this debt repayment machine fired up again. I could give you one excuse and reason after another about why my debt is where it is, but I don’t think I need to explain myself. I do want to say, though… that it’s not a spike in materialism. Most of it are travel expenses that I meant to pay off right away and then didn’t. but still. Here we go. Looking at that is like stepping on a scale after vacation, you know? but you have to face the numbers and the facts and see where you’re at. So here we go. Let’s knock out some debt. March is over. April is almost here… which means… it will soon be May, and then… SUMMER! I love SUMMER! I’m like Olaf! The past week or so I’ve felt really overwhelmed by (lack of) money – I was actually completely dreading my debt repayment post. And then I started crunching the numbers and I realized that I’m being too hard on myself. Not only am I ON TRACK for my goals for this year, I’m actually a little bit ahead. Just a teeny tiny bit, but still… nothing to beat myself up over. This past month I ended up charging a lot of church expenses on my credit card and I am still waiting on one reimbursement check for that. I just redeemed my Swagbucks for $25 in PayPal cash to put towards my credit card, and I have some pending affiliate payments that will go for that as well. According to my Mint.com goal, my projected payoff date for my credit card is August 1, 2016. My goal is to be out of credit card debt by the end of May. Happy birthday to me, right?! Wish me the most luck! Once my credit card is paid off, I might re-work my debt repayment recaps because of needing to pay my car off differently than I’d first imagined when I started this thing, and I’m so grateful for Brittany‘s post about paying off her car that made me realize that. How are all of you doing with your finances this month? If you write or have written about finance in any way, link up with Emilie and I for Final Friday Finance! February 2016 Debt Repayment Recap + Final Friday Linkup + a Giveaway! Not to freak you all out, but we’re 1/6th of the way through 2016. WHAT. It’s time to catch y’all up on what’s gone down with my debt repayment! The reason for the huuuuuge drop in my credit card was my tax return! I put my emergency savings at a safe place and then used the rest to make a big payment on my credit card. I got a few random payments (I redeemed Swagbucks, and I got a small payment for a program I’m a part of) and I transferred them immediately to my credit card balance. This is the habit I want to really develop in my life. I finally turned in my receipts for work purchases, so once I get reimbursed I can get my credit card under $1,000. Thanks to Brittany’s post about paying off her car, I started looking into paying off my car early and figured out a plan of action for once I get my credit card paid off (which I’m anticipating will happen NO LATER than May – but I think I can do it faster than that!). Maybe I procrastinated on getting my tabs renewed. Maybe. and MAYBE that resulted in a ticket + I still had to get them renewed. My tabs ended up costing me twice as much because of the ticket by the time I decided to pay for them. My own stupid fault. Like I’d mentioned before, I forgot to skip my JustFab payment. I put reminders in my phone so that I’ll know when it’s time to sign in and skip so I’m not charged $40 – that’s detrimental to my debt repayment! I lost my debit card somewhere. I know I lost it somewhere in my own personal belongings. During the time of not having the debit card and now waiting for the replacement card, I’ve been using my credit card and haven’t been the most diligent at paying it back every night. That’s my worst habit; making small purchases on my credit card and thinking “I’ll make a payment tonight,” and then not doing that. I’m still not completely caught up on where I need to be in order to be halfway out of debt by the end of the year, but the gap is smaller than last month! How did you do on your debt repayment/finances this month? Emilie and I are hosting Final Friday Finance! Link up any post you’ve written this month about either topic (as many posts as you want, as long as they are relevant)! IT’S THE FIRST DEBT REPAYMENT RECAP OF 2016!!!! Y’all I am SO EXCITED ABOUT THIS!!! My goal, by the end of the year, is to be halfway out of debt from where I started last May. That means I only have TWELVE posts in which to bring my debt down by nearly 40% of where it was at on the last day of 2015. Can I just say how much I LOVE the way you guys rally around my posts focused on being financially free? When I read someone’s blog and they say they were inspired or challenged by my transparency in my financial posts, I literally want to throw confetti in the air and eat a whole cake (literally a whole cake!) and hug the world. We can do this. But let’s get on to the fun stuff, shall we?? Here’s what happened this month. They called just to say hello. As we were talking, Lucy said “you’re coming to our house for Valentine’s Day!” To which I laughed and said “No, I am not.” she mentioned it a few times. HOW do you say no to that face? Like seriously. Wrong. So wrong. Yes, It’s a 3 paycheck month, but there weren’t 3 paychecks in-between my car payments. So the wiggle room I thought I had… was gone. I’ve figured out where I need to be at the end of each month in order to be halfway out of debt by the end of the year. How lame that I missed my first month’s goal, but so long as impulsive Nashville tickets are kept to a minimum, I’ll be okay. I was only $300 short of my goal this month, which is that extra paycheck I thought I had. I’m also going to start being diligent about any extra money I earn (through Swagbucks, blogging campaigns, babysitting, etc) goes directly towards paying off my credit card. To help us all stay accountable and honest about our finances this year, the Final Friday Finance linkup is back. Katie has been so busy with her move to Seattle (I MISS OUR MONDAY BLOGGING DATES!) but Emilie is joining the team. Emilie’s been posting about her finances and debt repayment so it is a no brainer. We encourage you to link up any posts you have written about finance – even if you’re just stumbling upon my debt repayment recaps for the first time and decide next week to start posting about your finances! Come back here and link up so we can encourage you and celebrate your successes! 2015 Debt Repayment Recap + What I’ve learned. It’s been a hot minute since I’ve posted a Debt Repayment Recap. I wish I could say it’s because I’ve been so engaged in a side hustle that I’ve had no time to blog or anything. But really it’s because I’ve been a little apathetic with my debt repayment and have subsequently been ashamed of bringing that to light. Like “they” say, though… slow progress is better than no progress, amiright?! 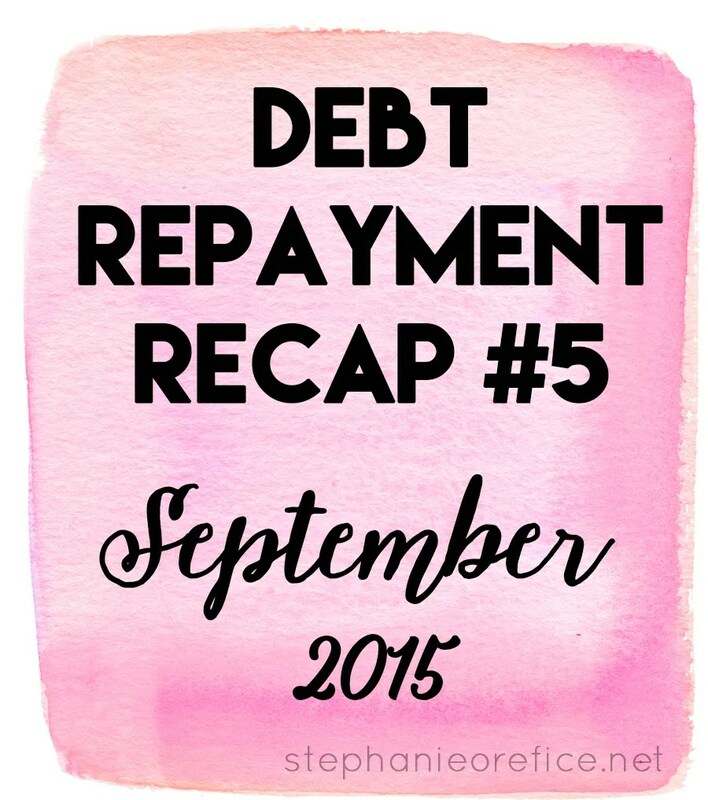 Here’s a look back on my debt repayment journey! Today, December 31, 2015 I am $19,779 in debt, meaning I have dropped my overall debt by 17.52% since I started paying off my debt. Money management is less about money and more about mentality. It’s not about the amount of money you make. If you are constantly thinking, “I’ll start taking care of my money when I have more money,” there is absolutely no way that’s actually going to happen. How you treat your money when you’re broke is the exact same way you’re going to treat your money when you’re well-off. From September – November, things really sucked. After plowing through my $2500 dental debt, I lost steam. I thought I could switch onto auto pilot and that I’d stay the course full steam ahead. Wrong. So wrong. I got a little loosey goosey. From May – August I dropped my debt by 11.7%, but from August – December I only dropped it by 6.52%. But here’s what matter: it kept going down. You can prepare to stay out of debt while you’re getting out of debt. Part of why my debt repayment slowed down a bit at the end of the year is because I finally started thinking about preparing for the future with my money. In July I drained my savings account to pay off a debt. From then on out, any expenses that popped up (like a new tire, an unexpected bill) had to be put on my credit card. I set up auto deposits to the savings account connected to my checking account. Thanks to Ernie, I opened an account at Betterment. Betterment is an investing service. I’ve been thinking about ways to invest my money but was at a complete loss as to how to do that. Betterment is great because you can set up an auto deposit, decide what percentage you want to divide into bonds and stocks… and then they invest it for you. I am IN LOVE with this service. Sign up with my referral link and you’ll get 6 months for free. Just so you know, I only got 1 month for free and I plan on paying from here on out (full disclosure: if you join with my link, I get a month free). Financial health rolls over into other areas of your life. For awhile I thought that financial health was just about what I chose to spend my money on. However, in my life I can see that the healthier I become financially the more I desire to improve my physical, spiritual, and emotional health. I don’t want to spend money, so I figure out ways to spend my time that don’t involve shopping or spending money without thinking about it. It requires more intentionality and TIME. Just paying my car payment every month next year will drop my debt by 24%. My goal is to drop my debt next year by… wait for it…. 39.37%. Here’s why. If, by next year at this time I have dropped my debt by 39.37% I will have cut my overall debt in half in 20 months. The magic number is $11,991. I’m thinking of going back to the cash only envelope system to really help jumpstart that – and how perfect that New Years starts on a payday, right? I can start the New Year on a cash-only system. What are your financial goals for 2016, and how did you do in 2015? Let’s keep on keeping on! I didn’t get paid for my vacation time for 4 days after payday, which threw off all of my automatic payments and stuff. and I had a hard time recovering from that. IN ADDITION to that, I got a bill from my dentist for $190 that hadn’t been covered by insurance. WHAAAT. I spent a lot more at the grocery store because of Whole 30. I went to Target twice – once for a baby shower gift and once for… well, the sad thing is I DON’T REMEMBER. Oh yeah. A candle and face wash and some other things. I was just all over the place. and you know how sometimes when everything feels all over the place and chaotic, it’s REALLY hard to find your footing? That’s how I’ve felt all month.